The key to an organization’s performance and productivity is rooted in its culture. In many of the most successful companies of the 21st century, you can find cultures that are focused at creativity and employee satisfaction. Culture is at the root of several things including employee morale and productivity. Many of the success stories of this century are a result of cultural change. Several of the technological organizations turned their fortunes around by reviving their cultures. Ford Motors too underwent a similar cultural overhaul years ago which was able to lift the company out of stagnancy and bring it back to a leadership position in the automotive industry. Under the leadership of Alan Mulally, Ford underwent a major change and since then, there has been no looking back for the automotive giant. Culture unites an organization like nothing else. It is like a binding force and the stronger the organizational culture, the higher the productivity and employee morale and better the company’s reputation in the market. A strong culture has the ability to eliminate several performance bottlenecks and organizations that are feeling caught in a situation of stagnancy must focus on this part to give the company a new direction and create momentum. Ford’s cultural change is one of the shining examples of cultural transformation in the 21st century. From Google to Starbucks and Ford there are several examples of excellent and unique organizational cultures. However, Ford’s story is distinctly unique and the role of leadership in building an original and extraordinary culture cannot be missed. Alan Mulally was able to achieve an extraordinary feat when he reversed the organization’s fortune through his One Ford plan. The role of the leadership is central to the making of an organization’s culture and long term performance is not possible unless a company has built a long lasting culture. Even the most performance oriented companies like Microsoft and Amazon have started focusing on this area to make their cultural foundation stronger. Leaders like Howard Schultz have focused on their cultures right since the foundation of their brands and it is a reason why Starbucks is a leading brand. The case of organizational culture has grown particularly strong in the 21st century. Research has linked it with several important things including employee performance, organizational productivity and even with the image and reputation of the brand. When Alan Mulally took charge, it were the difficult days for Ford. Mually saw an opportunity for change there and brought performance back on line by bringing a cultural alignment throughout the organization. Ford was like reborn. Many would find it difficult to believe that Ford CEO Alan Mulally pulled off a miracle just by using a simple cultural mantra. Ford, at the time, CEO Mulally became CEO, was on the verge of bankruptcy. In 2006, Alan Mulally was selected as the CEO of Ford and the company was getting ready to post the biggest loss in its history of $12.7 Billion. Now, more than ten years have passed and Mullally’s leadership is being cited as one of the best examples of innovative leadership in corporate circles. Mullaly worked to bring authenticity to the culture of Ford and within a few years, the financial condition of Ford was the exact opposite of what it was before his joining. Ford’s performance continued to surge and people were amazed by the change that One Ford plan brought around. Leadership’s role was very critical throughout the change as Mulally himself noted in his interviews that to align between the internal and external environments of a business is important. It is critical to note that changes going on in the external environment and being ready to respond to them which has always been a critical part of Ford’s organizational culture. The road from the brink of bankruptcy to fast financial growth was made possible through a fight on two fronts. One was the cultural front and the other was financial saving. However the financial planning might not have worked, had Mulally not been able to instill a sense of unity in his team through a focus on cultural stability. He knew that somewhere the instability inside the organization was a result of the instability and holes in the organizational culture. Therefore, teams were working in different directions and the level of collaboration required to bring Ford out of the pit was missing. Before Mulally, Ford was being through very hard days. The company had lost a very large market share; around a quarter of its market share since 1990. None of the brands from its large portfolio was doing well in the market and all of them were in a dire need for fresh credit infusion. The company was lagging behind the Japanese auto brands in terms of cycle time for development of new vehicles. High labor costs were also leading to losses by raising the operational costs very high for Ford Motors both domestically and in the overseas market. The company was plagued with issues and unless the entire company made efforts together, it was difficult to achieve a leadership position again. Mulally laid out a plan which he called the ‘One Ford’ plan. This was a strategy that required efforts at four fronts – Bringing the entire Ford team together globally, Leveraging Ford’s unique assets and technological knowhow, making vehicles that people valued and arranging the credit required for these efforts. However, Mulally’s vision succeeded and the much needed change was brought around. His compelling vision was successful at aligning the entire company and successfully synchronizing the entire team’s efforts. To understand Ford’s culture it is important to understand Mulally’s One Ford plan because it is at the core of Ford’ culture. 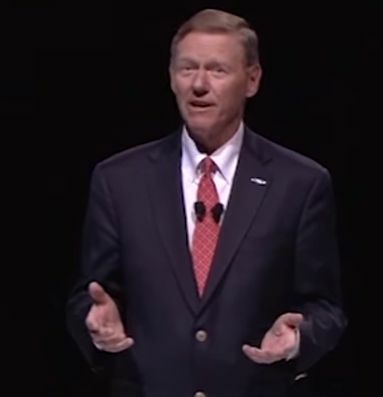 Actually, Mulally laid it down in the form of the organization’s mission and vision. One Ford means one team and that is not just a catch phrase used to inspire unity throughout Ford but workers at Ford are expected to model certain behaviors. People at Ford are committed to the organization and to each other. One Ford was about collaboration at the organizational level. People are not working for themselves but for the organization and the team and for each other. The collaboration mantra has been adopted by several companies and even at Google people collaborate with each other to generate results. Ford is a quite large organization with operations around the world and its people have to stay focused all the time due to the highly competitive nature of the automotive industry. Every person’s job at Ford is more than about a single person; it is rather about a business. The people who prefer to work the other way, either or leave or adapt to the Ford culture. Alan Mulally introduced several practices that have brought the entire organization closer and helped Ford’s people stay focused at the core objectives of the business. At Ford they have a BPR or Business Plan Review meeting every week that every business leader and functional leader attends either personally or remotely. The global business environment and related topics like economy, labor, energy and technology sectors, demographic trends and the shape and size of competition are talked of at the meeting. Future is an important factor in the context of Ford’s organizational culture and these practices have been instituted by the leader so as to maintain a constant focus on future and the changes happening at the moment. Ford has not deviated from the vision that Henry Ford had for it. However, it has started leveraging its strengths to build a brand that is all new and unified through a cultural thread. The world is changing fast and the culture at Ford enables futuristic thinking, collaboration and fast action. Such cultures are well known to facilitate productive thinking throughout the organization. Mulally’s cultural innovation has become a lesson for others and is discussed with amazement and inspiration in both corporate and academic circles.